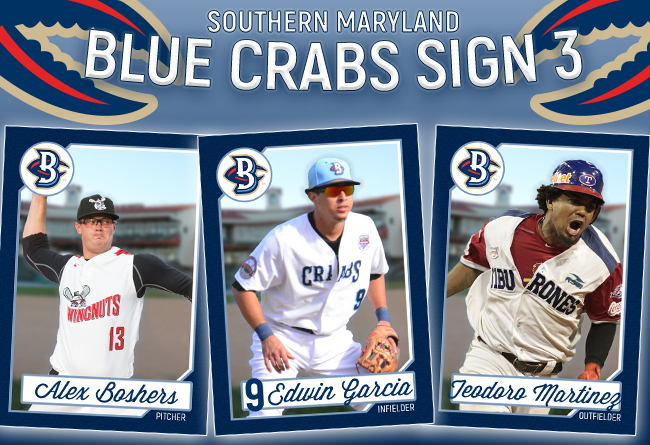 (Waldorf, Md., Jan. 31, 2018) - The Southern Maryland Blue Crabs have announced their first three signings of the 2018 season, led by the return of shortstop Edwin Garcia. Garcia will be joined by a fellow Venezuelan, Outfielder Teodoro Martinez, as well as Pitcher Alex Boshers. Garcia rejoins the Blue Crabs after a successful 2017 season. During his first campaign with the team, Garcia led in games played and hits. His 134 appearances on the regular season ranked him third in the league, while he also appeared in the top 10 in at-bats (534), hits (139), and runs scored (69). The Venezuela native made his professional baseball debut in 2008 at the age of 17. He spent his first eight professional seasons in the Texas Rangers organization, reaching as high as AAA, before joining Southern Maryland last season. Martinez will rejoin his fellow countryman with the Blue Crabs this season. A native of La Guaira, Venezuela, Martinez began his professional baseball career in 2009, joining Garcia in the Rangers organization. The 25-year-old spent six seasons with the Rangers affiliates before spending 2015 in the New York Yankees organization. He has spent the last two seasons playing between the Venezuelan Winter League and the Mexican League, appearing for Los Tigres de Aragua and Los Generales de Durango. The right-hander Boshers will make his Atlantic League debut in 2018, joining the Blue Crabs after three seasons in the American Association. The 26-year-old went undrafted out of the University of Tennessee-Martin. He signed his first professional contract with the Wichita Wingnuts in 2015, one year removed from college. Boshers came on strong in his debut season, going 4-2 with a 1.86 ERA working primarily as a reliever in 2015. In his last two seasons with the Wingnuts, the righty transitioned to a starting role, going 23-7 across the two seasons, posting a 3.29 ERA in 2016 and following that with a 3.72 last season.